It’s as if the heat is getting relentless by the day. But, as it turns out, the summers are here to stay for a while longer, and if you are planning to crib less and make the most of what you can of the season, then you are at the right place. One of the primary victims of the scorching heat is our tummy. It is very important to eat light and clean in summers to keep your stomach cool. Digestive problems, loose motions and food poisoning are a common occurrence in summers. Eating out often, or binge-eating junk food, are likely to take your tummy for a ride, which is why it is very important for you to switch to a detox mode as often as possible. So, what does detoxification really mean and why is it important? As the name suggests, detoxing aims to help the body rid itself of toxins. The human body has many natural pathways to allow detoxification through liver, sweat, urine, feaces and more. But, with our increased dependence on refined and processed food often increases the load on our digestive system. There are plenty of seasonal fruits and vegetables that can help your body cleanse itself from harmful toxins and rejuvenate you from within. Detoxing has many other benefits like enhancing liver function, boosting skin health, weight loss etc. Ninety-four percent of watermelon’s weight is just water. Meaning, it is one of the most hydrating and filling foods you can have this scorching weather. By filling you up with all water and nutrients, it helps prevent toxic build up. Watermelon is a negative calorie fruit and tends to burn more calories during digestion than add in, which helps aid weight loss. It’s also packed with vitamin A and C, which can do wonders for your skin. Watermelon is also loaded with lycopene that helps boost eye health too. Cucumber is made up of about 95 percent water and is a classic hydrating and cool food. It eliminates toxins from the body and keeps you healthy from inside. Cucumber contains a great range of bioavailable minerals, vitamins and electrolytes. Eating cucumbers makes you feel full without adding much to your calorie load. Half a cup of sliced cucumber only has 8 calories. 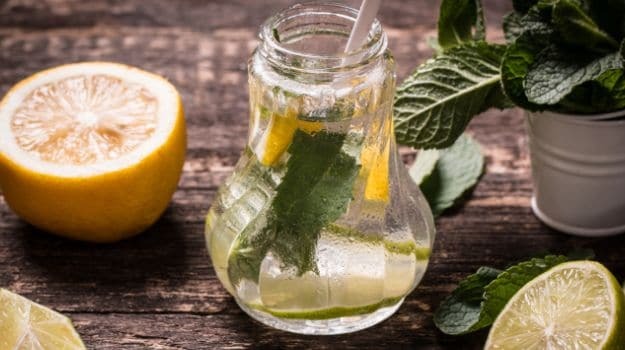 According to the book, ‘Healing Foods’ by DK Publishing House, lemons are natural diuretic and could help reduce swelling, inflammation and water retention. Being antibacterial in nature, they also help flush out bacteria that could cause Urinary Tract Infection. A lemon water detox can also help you shed those extra kilos, due to its richness in pectin fibre. This fibre helps you to feel full for a longer period of time. Lemon water is also said to relieve many digestive woes. Experts claim that the ketones in raspberries prevent weight gain to a great extent. Raspberries are also rich in vitamin B and C, which could do wonders for your skin. There is a reason why mint is one of India’s favourite summer staple. We use it in our chutneys, raita, and even garnish our biryanis with the cooling herb. Mint improves the flow of bile through the stomach, which speeds up the digestion and metabolism. The active oil menthol present in mint has antiseptic and antibacterial properties that help relieve indigestion and also soothe an upset stomach. The high quantum of antioxidants also help prevent free radical activity, giving you clearer and youthful skin. Mint is an excellent remedy to treat nausea. It is also effective for treating nausea that happens in morning sickness. Load up on these summer foods and detox this scorching weather.